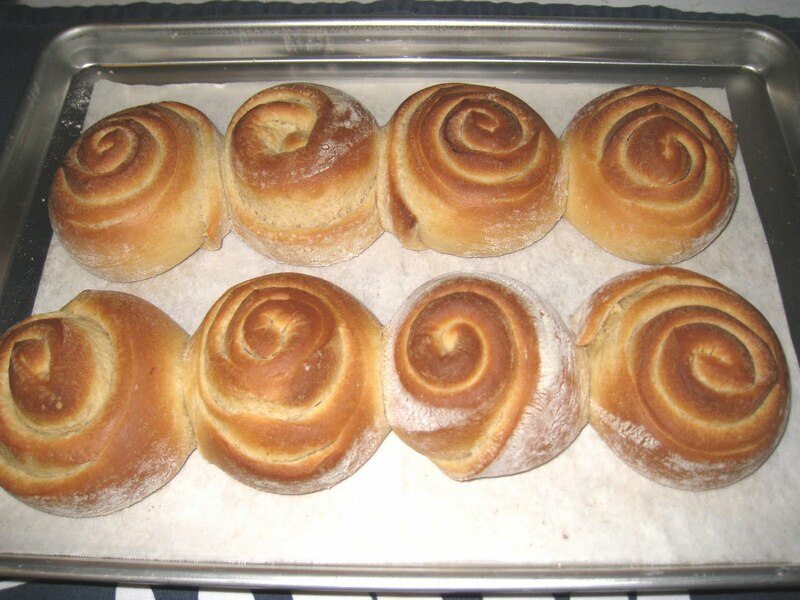 I came across the recipe for this Puerto Rican bread several years ago in Saveur magazine and saved it because I was intrigued by the idea of rolling the dough into long strips and coiling it into a spiral to shape the rolls. 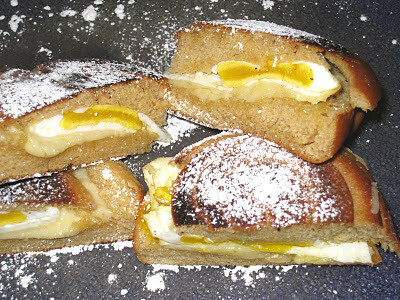 When I made them, I was pleased at how soft and moist they were, with just the right hint of sweetness. They reminded me of hamburger buns. The recipe included the makings of the ham and egg sandwich that apparently goes by the same name in Puerto Rico. I made the sandwiches with just eggs for the first two that I ate but I was not all that impressed and the powdered sugar was too much for just the egg. To be fair, I think they would have been delicious with the ham and I would still make them that way. I made a wonderful discovery for the rest of the rolls (pictured to the left without powdered sugar all over them). I made a batch of these Sloppy Joes right after I made the mallorcas and that was a perfect match for these babies! Combine yeast and 1/4 cup water heated to 115° F in a bowl; let sit until foamy, about 10 minutes. Stir in milk, 4 tablespoons butter, and egg yolks until smooth. Add flour, sugar and salt; stir until dough forms. Transfer to a work surface; knead until smooth, about 8 minutes. Transfer to a greased bowl, cover with plastic wrap, and let sit until doubled in size, about 1 hour. Transfer dough to a floured work surface and, using a rolling pin, roll into a 18 x 8" rectangle. 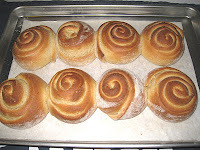 Brush with 2 tablespoons butter; starting at one short end, roll into a tight cylinder. Cut cylinder into 6 equal pieces; transfer, cut side-down, to a greased 9 x 13" baking pan. Cover with plastic wrap; let sit until doubled in size, about 1-1/2 to 2 hours. Heat oven to 375 deg. F. Bake until lightly browned, about 18 minutes. Let cool completely.